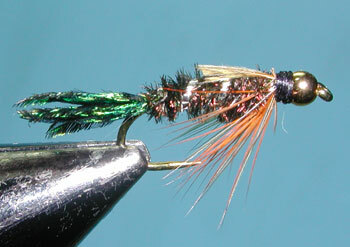 Notes: Cliff Zug designed this fly in West Lawn, PA and it became a popular fly within the Catskills. During the 1940's, it made it's way West to Yellowstone and, subsequently the Sierras, through the accolades of Arnold Gingrich within his publications and articles. 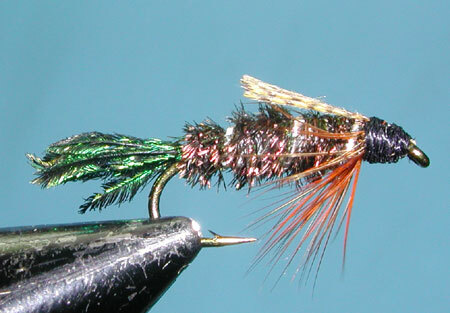 Today, like the Prince Nymph, this peacock-bodied nymph continues to be one of the top ten flies on many flyfishermen's lists. Since the Zug Bug imitates cased caddis and caddis larvae, it's important to develop a cigar-shaped body. Utilizing lead-free wire wraps on the middle of the shank helps to promote the proper profile. Unique to this fly is the wingcase which is only tied down at the front and gives the Zug a caddis-type wing appearance. The use of Peacock Herl for the body and Peacock Sword for the tail also gives this fly a great attraction quality. On slow moving streams, fish the fly near the bottom as a dead drift. The Zug also makes a very good stillwater fly, particularly as a dropper behind a leech pattern.